Made in USA Promotional Golf Umbrella. High quality, no frills umbrella that you can have custom made with any color panels and your logo. Umbrella manufacturing in America has all but died out, however, after yet another opportunity arose, we were determined to find a source. CEOgolfshop now offers two Made in USA umbrella’s, a golf umbrella, and a fashion umbrella. For when you absolutely positively need an American made umbrella, these are the two options! 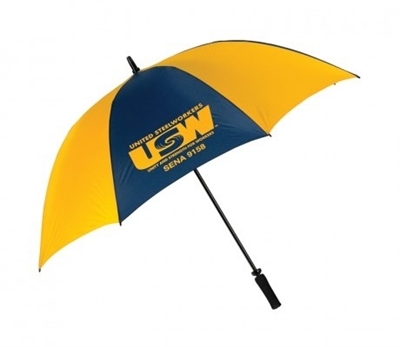 It’s a good quality, no frills umbrella that will have the unite union made label inside. We can manufacture with a wide array of color panel options and logo placements. Fiberglass shaft and fiberglass ribs. Windproof feature for extra durability in high winds. Choice of handles; black foam. Nylon fabric- many color panel choices, in any combination. Send your PMS for closest match. Where to buy: CEOgolfshop made in USA 62 golf umbrella. Always free shipping and no set up fee for one color, one location imprinting with minimum order. Solar charger can charge your mobile phone, iPod, iPhone, PDA, PSP, Mp3, Mp4, PMP and other digital devices (up to 1200 mAh). FREE setup and one color imprinting at CEOgolfshop with mention of this blog article. Have you ever been on an airplane and your mobile device battery went dead? Or any other time you weren’t tied to electricity? T103 Solar chargers by Spector and Co are eco friendly gifts that anyone using a mobile device will appreciate. The green lights showing the charge level are a feature everyone wants too. Why is a mobile solar charger a great promotional and incentive gift? How long will it take with custom logo? 5-7 days after proof approval. Faster times available upon request. CEOgolfshop promotional web site. Note: All customers submit orders without payment. The order total is confirmed and einvoice will follow. Alternative: Quattro 4-in-1 Charging Kit – Benni 2800 mAh power bank, a 2.1A USB port car charger, a dual USB port wall charger and a USB charging cable with 3 different plugs in a case with optional debossing; minimum 10 units @$50. LIMITED TIME OFFER- as low as $45, reduced from $55 while supplies last.